We had quite a bit of ham leftover from the Tangy Honey Glazed Ham I had made, plus some pineapple that I had cut for the glaze. 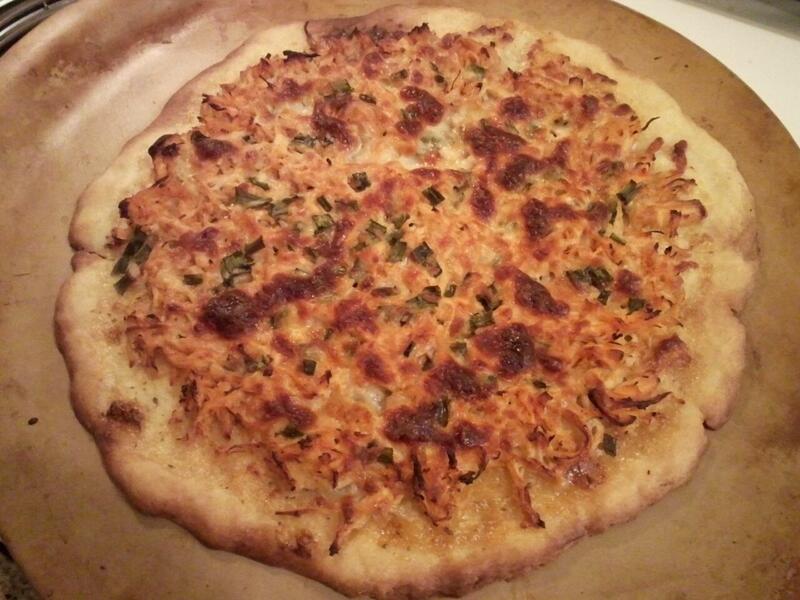 Coincidentally, I also had a pizza crust from the Sunizona Family Farms bakery. So, what to make??? 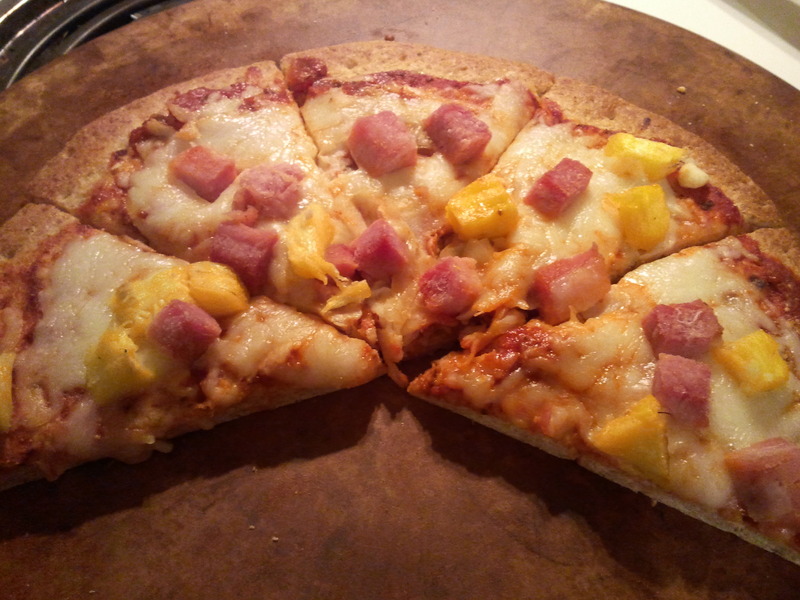 Ham and pineapple pizza! It turned out so great! So great, that I almost forgot to snap a picture! In recent weeks of Bountiful Baskets, I have received a lot of tomatoes. I like tomatoes in salads, but I also wanted to try some new things with them. One of those things was pizza sauce. Most recipes I found called for canned, diced tomatoes or canned, whole tomatoes, or tomato paste, and while I knew I could make those things with fresh tomatoes, I didn’t want to spend the extra time. So, I finally found a recipe on AllRecipes.com that was exactly what I wanted, a recipe that used fresh tomatoes and didn’t require any extra prep to those tomatoes. Perfect! It also used up the rest of my fresh basil and fresh oregano, and some of the fresh parsley in my Italian veggie pack. Even better! This sauce was used on a Sausage Florentine Pizza. 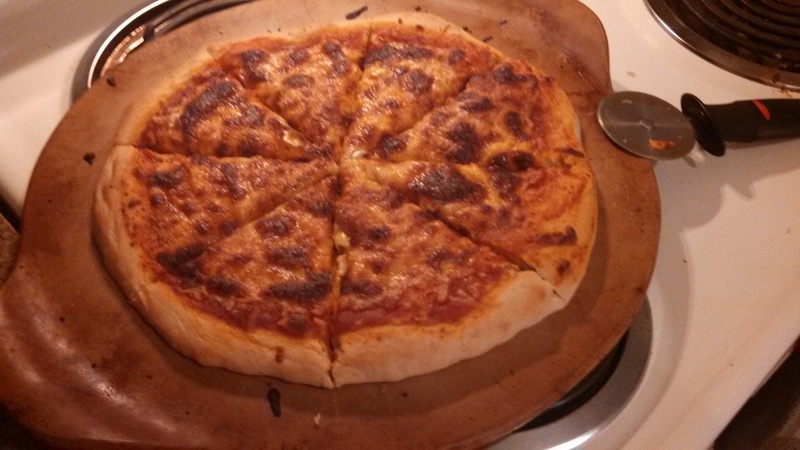 It made about 1 1/2 cups of sauce, so was perfect for the size pizza I was making. Place all ingredients in a food processor. 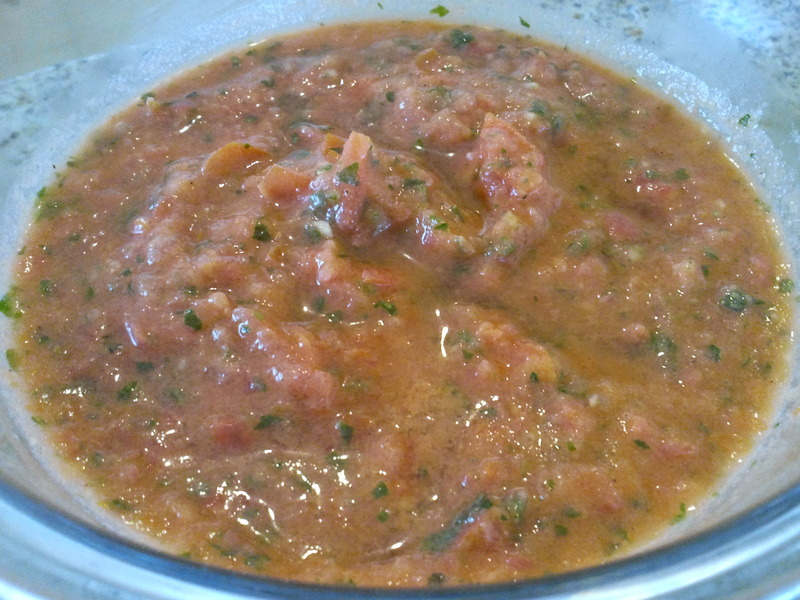 Do not liquefy, sauce should remain somewhat chunky. If you like to try out new products and host parties, you should look into HouseParty.com. Manufacturers that want to promote a product work with House Party to get those products out to people who are interested in hosting parties. Previously, I have hosted a Shutterfly Photobook party, a Febreze Set & Refresh party, and a Huggies Pull Ups Potty Dance party. Each time, I got free products to share with guests, plus coupons and idea booklets for them to take home. They all went really well. 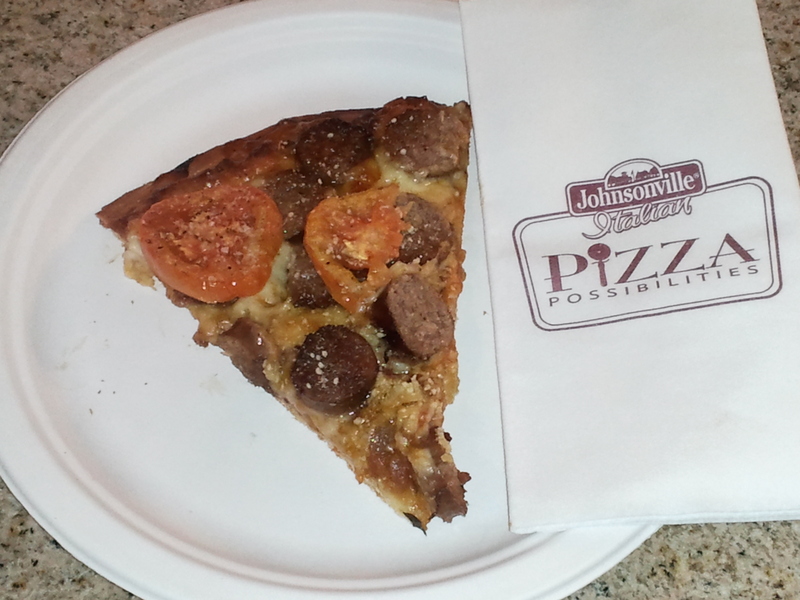 In October of last year, I applied and was selected to be a Johnsonville Italian Pizza Possibilities party hostess. I am already a big fan of Johnsonville sausage and brats, but had never used the sausage for pizza, so this was a good fit for me to try something new. Unfortunately, some things came up in life and I wasn’t able to host an actual party. So, now that things have slowed down a bit, I’m able to tell you about Johnsonville and share some of the recipes that were in the booklet with the party. To start, let’s first talk about what I received in my party kit. 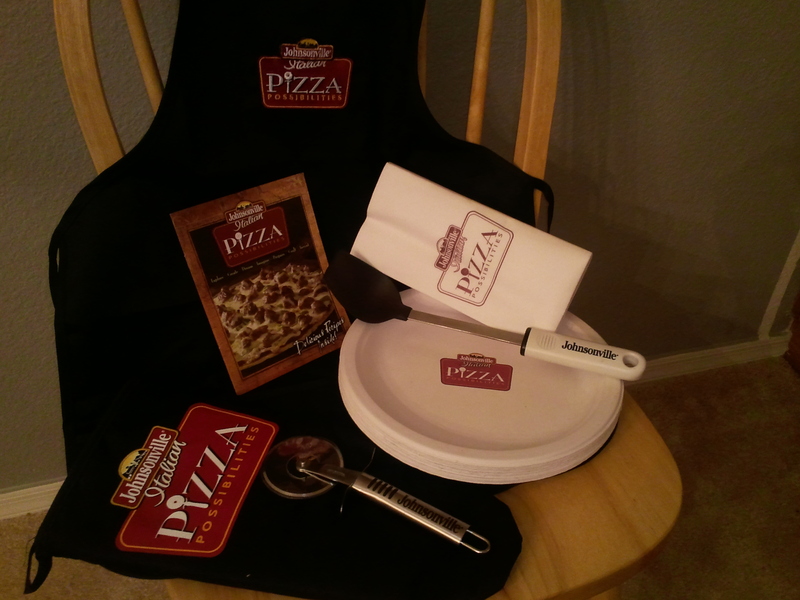 Shown above is an apron, recipe booklet, oven mitt, pizza cutter, paper plates, napkins, and a spoon for spreading pizza sauce. Also included were coupons for me to get free packages of Johnsonville Italian Sausage and Sargento shredded cheese to use for the party, plus $1 off coupons for the party guests (which I did distribute to some friends). If you would like to see the recipes in the booklet, you can find them here. 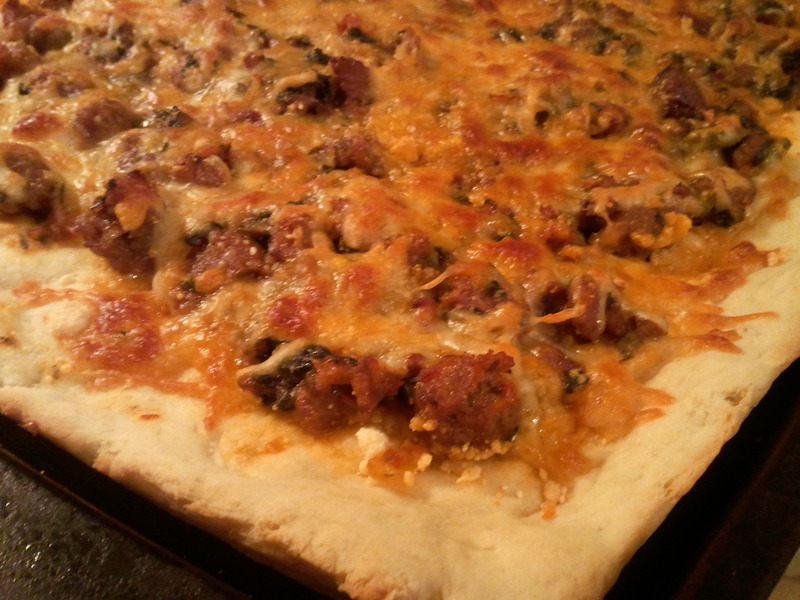 So, tonight I made the Sausage Florentine Pizza. 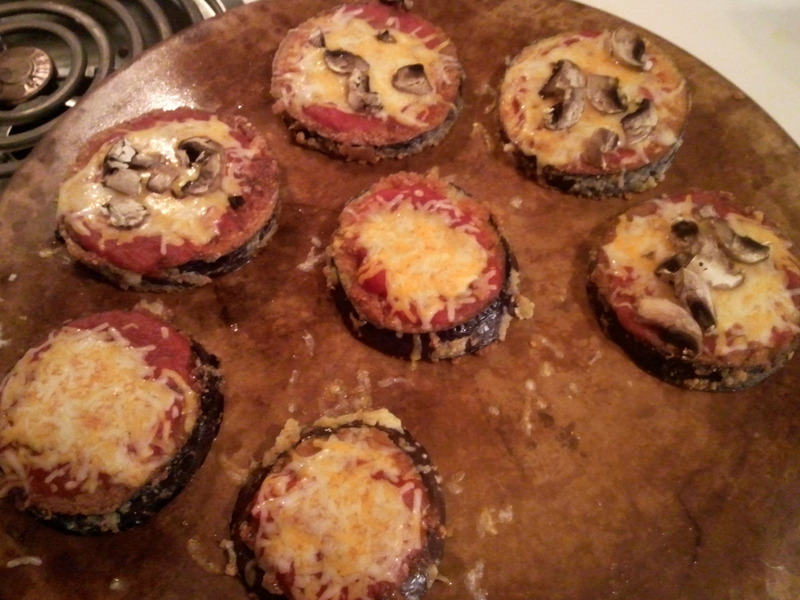 I didn’t have mushrooms, but used onions instead. I used a homemade pizza sauce for it (recipe coming soon), and because my sauce had lots of fresh spices in it, I did not add the oregano and basil called for in their recipe. I also used fresh spinach that I chopped instead of using frozen spinach. 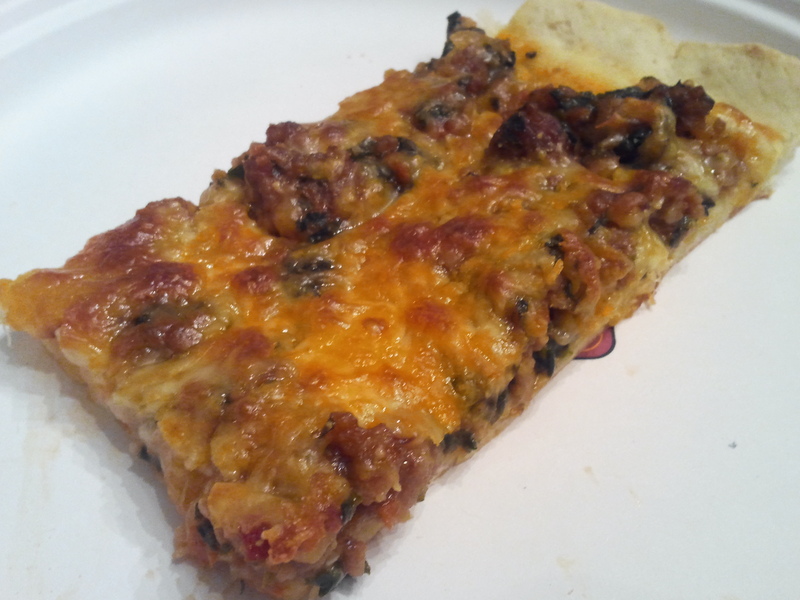 I used 2 packages of pizza crust mix to make the pizza a little larger, on one of my baking sheets, so I also used more sauce, spinach, and cheese than what their recipe calls for. It was great and the family loved it! I’m not sure which recipe I will try next, but they all sound delicious! So, stay tuned to see what I pick. In the Italian themed veggie pack I got from Bountiful Baskets, I got some fresh herbs, which included basil. I like pesto, but have never actually made it, so I decided the basil would be made into pesto. I still have some spinach left from my 1/7 basket, so the Spinach Basil Pesto recipe I came across on allrecipes.com seemed perfect to try. 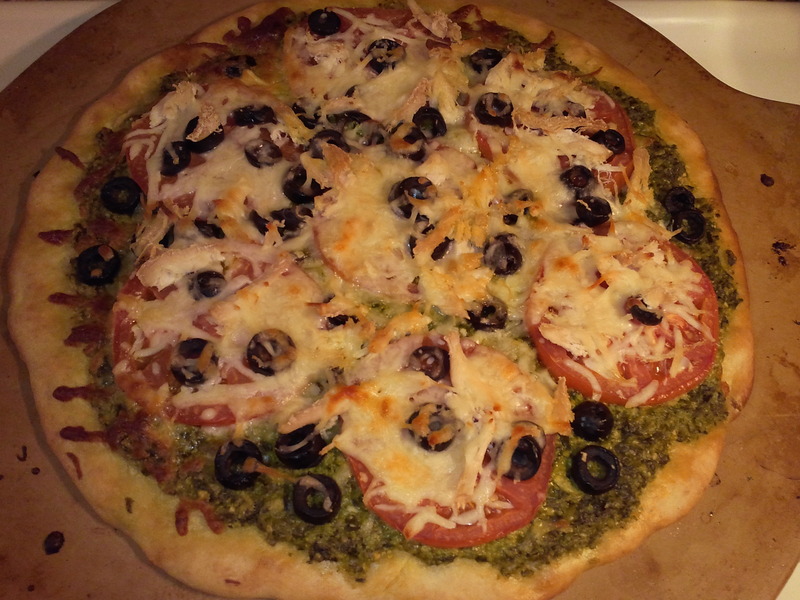 Since I had plenty of tomatoes to use, I wanted to make a pizza with the pesto as the sauce. I had sliced olives on hand, and I used chicken from a rotisserie chicken I bought at the store. 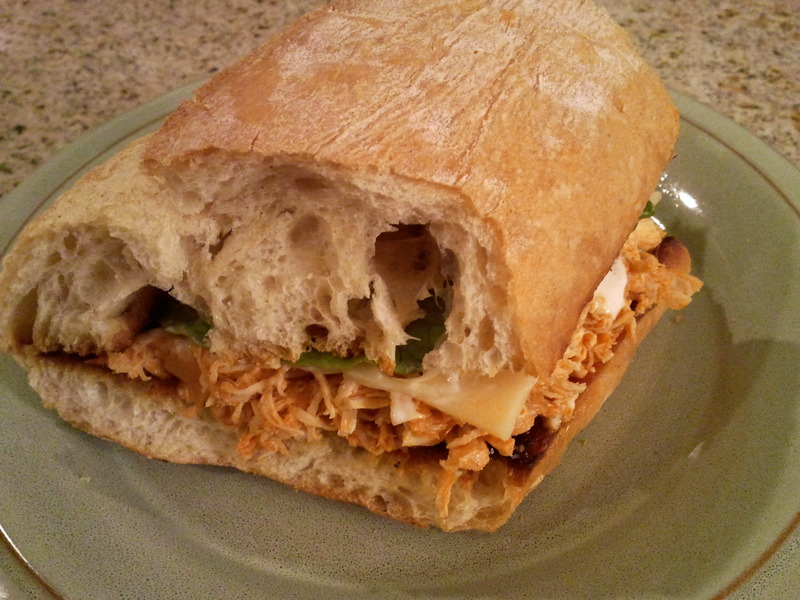 I was hoping to also add feta cheese, but it didn’t make it into the fridge after the store, so I used mozzarella. The crust was from a pouch, since I’m really bad at making breads from scratch. The results were delicious! 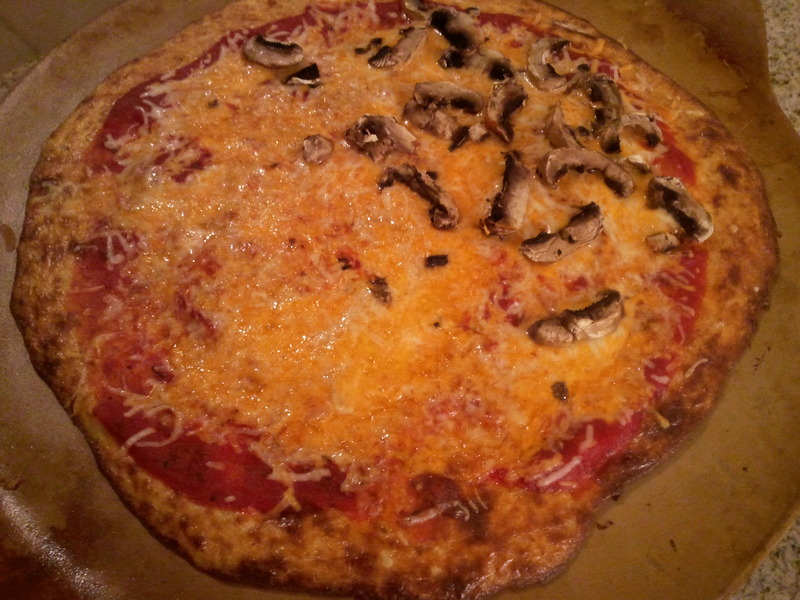 There are a number of other toppings that would go great with this, red onion, yellow onion, green peppers, mushrooms, so I suggest using your favorites! Blend the spinach, basil, pine nuts, Parmesan cheese, garlic, salt, pepper, lemon juice, and 2 tablespoons olive oil in a food processor until nearly smooth, scraping the sides of the bowl with a spatula as necessary. Drizzle the remaining olive oil into the mixture while processing until smooth. 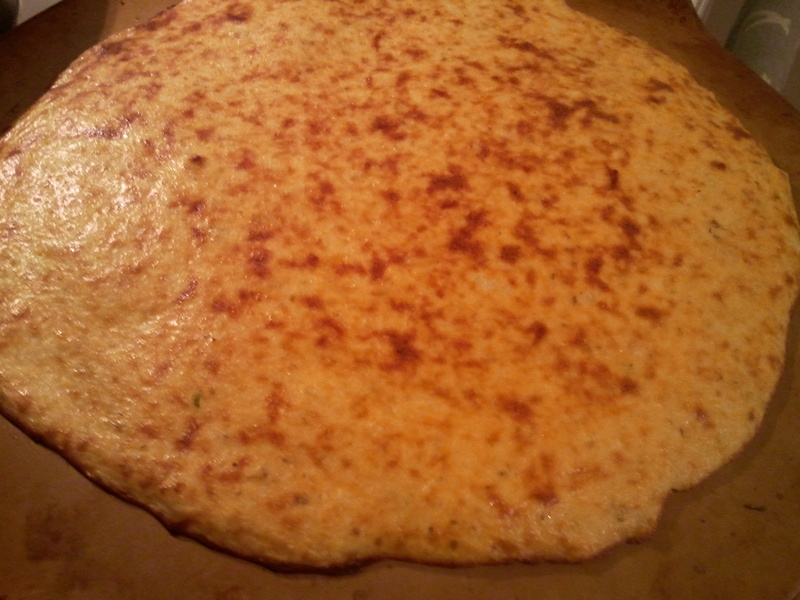 Prepare pizza crust. 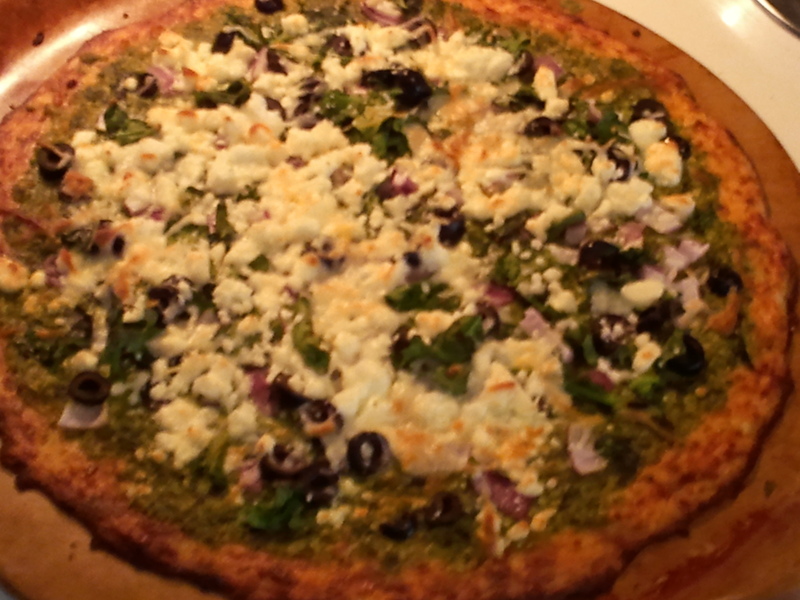 Spread pesto evenly on crust. 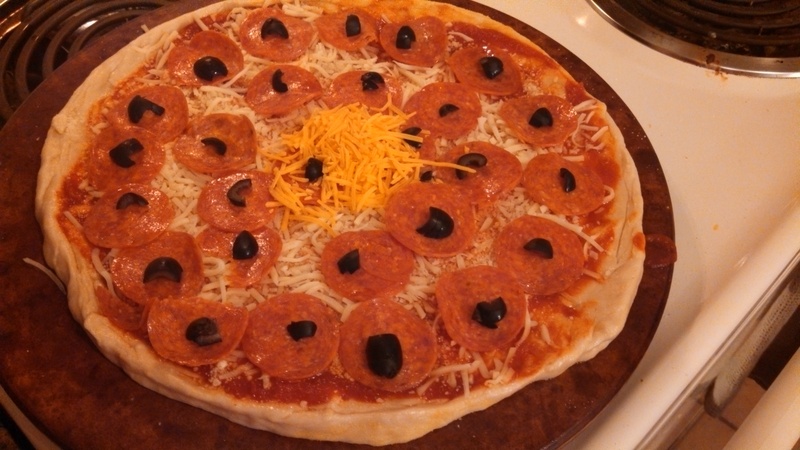 Add the pizza toppings, then the cheese. Bake according to the directions for your crust, most likely around 425 F for 12-15 minutes, or until golden brown.